Do you think Tom Cruise was a victim of teasing and #bullying as a kid that created his tough guy attitude he projects today? 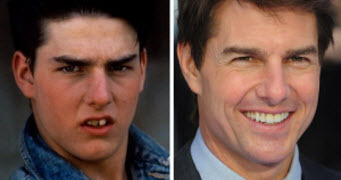 He actually went through orthodontic treatment twice, in his teens to straighten his teeth and broaden his smile and again as an adult to correct a midline discrepancy that was still apparent in photographs. His smile is obviously something he is very aware of and very important to him. Children can be cruel and parents often ask for the help of Honig Orthodontics when they know their kids are being teased or bullied because of his or her appearance. Our goal at Honig Orthodontics is to address the personalized needs of any patient at any age. Contact our office for a complimentary smile evaluation and let us help you determine how we can best help you and your child who is a victim of #bullying or teasing.